When I had my recent poor experience of trying to buy some lamb shanks, I thought it was an isolated incident. However, I was wrong. There is an oft used expression in marketing circles. That phrase is ‘Retail Theatre’. You know the sort of stuff; a rotund, jolly looking chap carrying freshly baked bread on a tray above his head or the vegetable aisles that look similar to a Shakespearian street scene. I am all in favour of a bit of the theatrical when I’m out and about buying the staples. But, when style pushes a knife through the arras and kills substance as effectively as Hamlet saw off Polonius, It’s time for me to take to the stage. When I go to the butchery counter to seek out my pound (500 grammes) of flesh, I expect to be served by either a butcher or a butcher’s understudy. Sadly, in the theatre that is the modern supermarket, the stage hands are often given the stripy apron and silly hat. This a butcher does not make. They are (with deference to the faux-filet) a Faux Butcher or ‘Futcher’ for short. Once dressed, they are pushed from the dressing rooms onto the great retail stage and into the glow of the meat counter footlights. Futcher moves upstage to consult with ‘Second Player’, an older, and perhaps more qualified personage. A whispered conversation ensues, with nervous glances in my direction. Futcher moves downstage and re-engages with me. At this stage, I really did not want to let it go, so I asked for short ribs. My enquiry was met with a blank stare, as if my asking “Do you have short ribs?” was the opening line in a music hall gag. It was time for me to exit, stage left, and go to a real butcher shop. 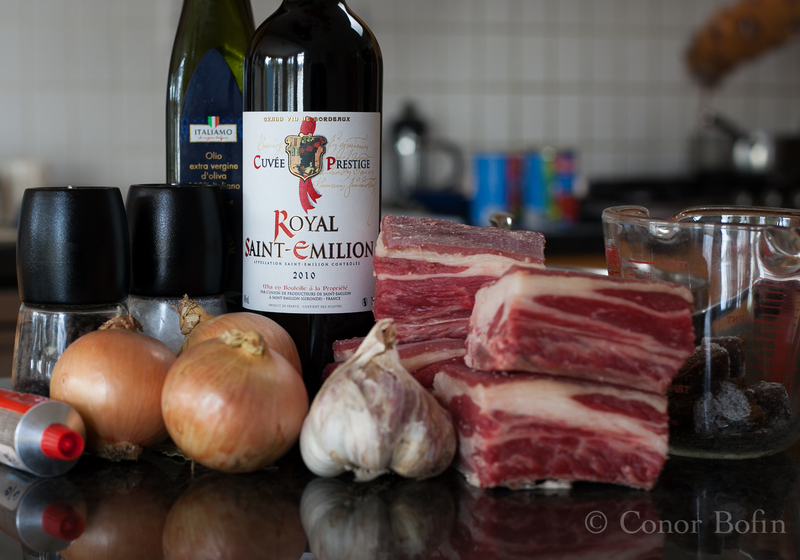 A quick spin to Fenelon’s Butchers in Stillorgan, near my home (why did I bother with the supermarket? 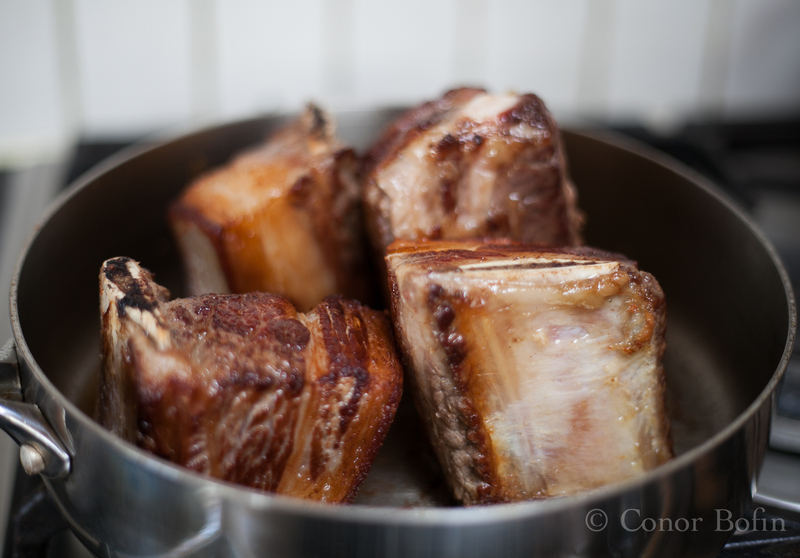 ), yielded some lovely short ribs, prepared by a real butcher. I had decided to rest the shins for another performance. 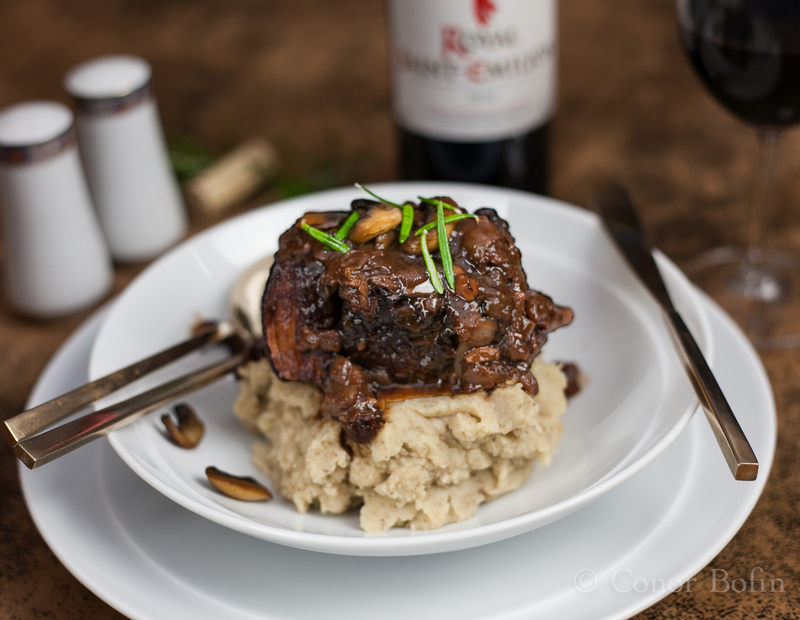 I got to thinking about what to prepare and decided upon Beef Short Ribs with Red Wine and Onion Gravy, served with Mushroom Mash. The mushroom mash involves adding blended reconstituted dried porcini and chestnut mushrooms to mash. Delicious. The beef with its supporting cast. Enough to feed four hungry adults. First, brown the ribs on all sides in a deep pan. When I say “all sides”, I mean all sides. Everything will be cooked in this pan so choose it well. Then chop your onions. 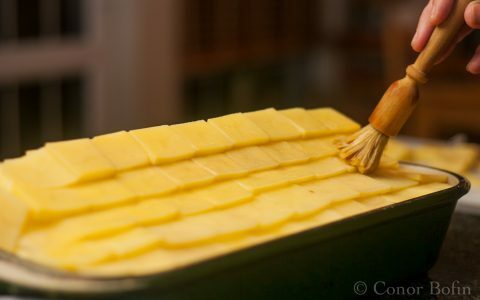 Add them to the pan and soften, while getting up any brown bits stuck to the pan. Chop and add the garlic about half way through the caramelisation. Cut the onions the way a theatre critic can slice a performance. Side note on cutting reviews: Tim Walker’s Review of Viva Forever, is as cutting as it gets. A brief excerpt: “One cannot, however, ignore the old tosh-o-meter, when the needle goes off the scale to register a show that’s so bad, it ought, if there were any justice, to be accorded a minus-star rating. This show is not just bad, it is definitively, monumentally and historically bad.” Ouch! Caramelise the onions over a low heat to prevent burning. Add back the beef. Add the wine and the tomato paste. Then season well. About that much tomato paste should do it. It’s open to creative interpretation. 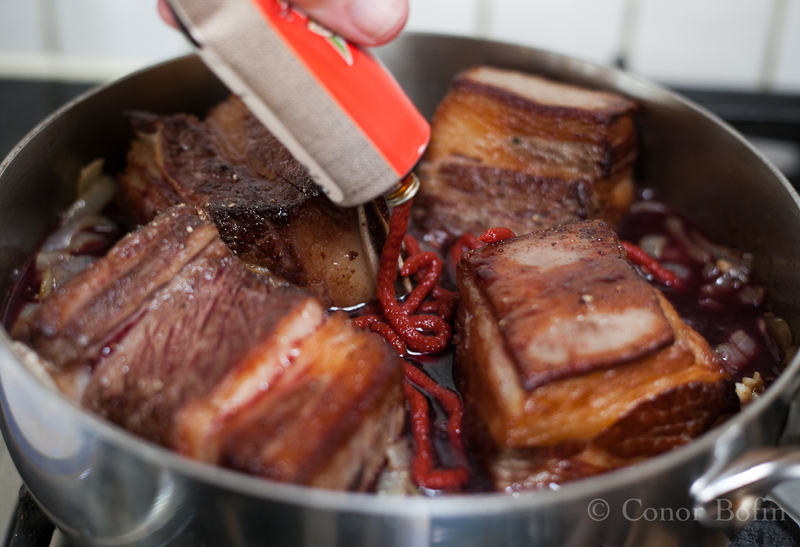 Then add the beef stock. The addition of the stock heralds the end of Act one in this little drama. 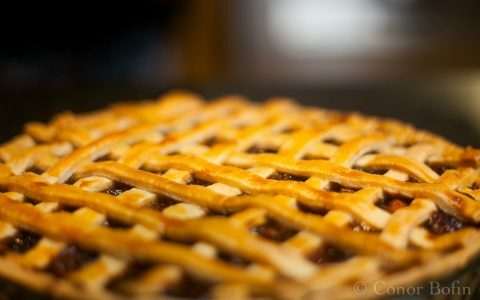 You will have enough time to go for a stroll down Broadway while this cooks, with a lid on, in a 150º C oven. It needs to be in there for between five and six hours. Why not take in a show while you are at it? You will have plenty of time. At around the two to three-hour stage, turn the beef in the gravy. After five or six hours, take the beef out of the pan. Spoon off the layer of beef fat that will have accumulated. 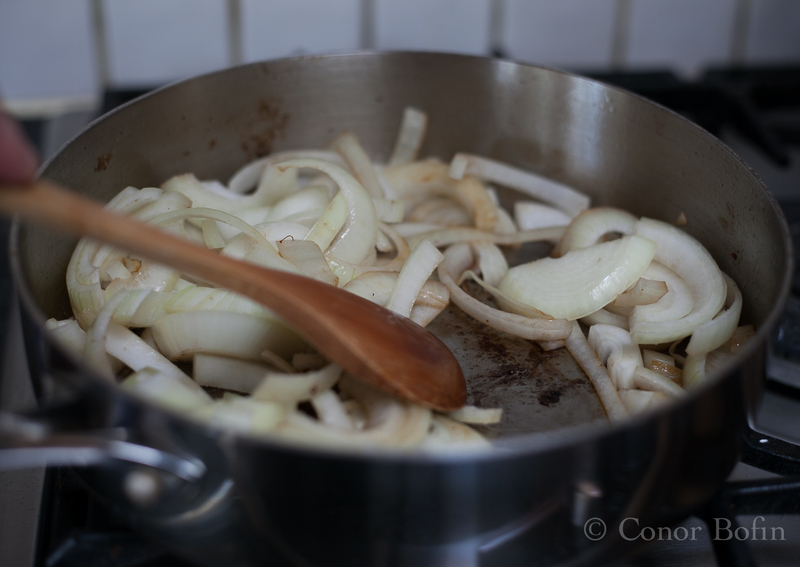 Place the pan on the stove top and reduce the onion gravy by about half. Put a big dollop of mushroom mash in the middle of a bowl. 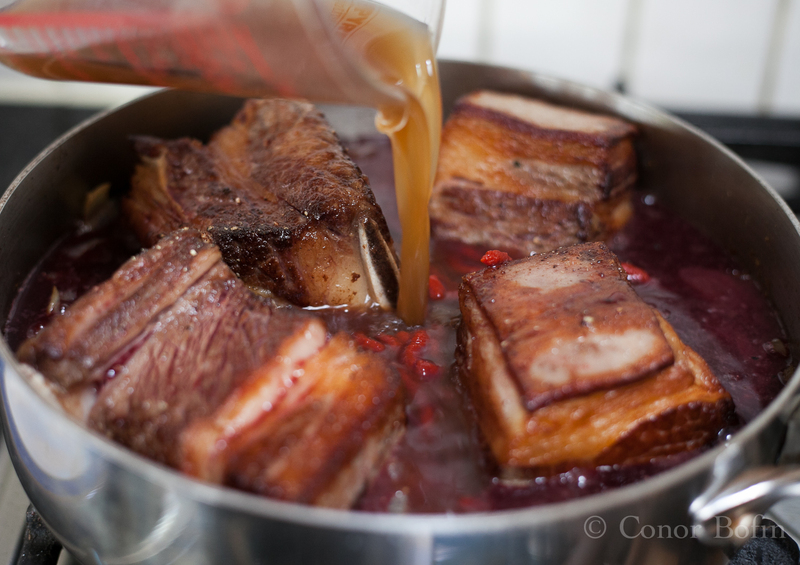 Balance one of the short ribs on top and spoon over the wine and onion gravy. Perhaps I overdid the mash? Perhaps not. It was perfect with the beef. The mushroom mash had the character to provided the support that a truly great performance demands. Though the beef with wine and onion gravy was truly the scene stealer. Naturally, there was a libation involved (as there is after many great performances). This time it was a bottle of Royal Saint Emelion, picked up in the town of the same name some months ago. It’s time for me to make my final curtain call on this one. It was a memorable performance. But none of the plaudits go to that bad actor the Futcher. He needs to wander his lonely way out the stage door and leave the retail theatricals to the professionals. Chocolate Fondant, scoff it if you can! Those are some great looking short ribs, Conor. I always get meat from a real butcher. Unfortunately, he does not carry short ribs because it is an unknown cut in these parts. You are missing a great treat Stefan. It’s the sort of meat you could very usefully cook sous vide, probably over a weekend or so. It is delicious. I order it online sometimes, and you are correct that it is wonderful sous-vide (cooked for 48 hours at 57ºC). It would be so much easier if my local butcher were to carry it. That looks fabulous and I love the sound of your mushroom mash. To futchers we must add fungers, or faux fishmongers. I once made the mistake of asking the pimply lad at the self-styled “fresh fishmonger” section of my local supermarket to fillet some fish. Had to do it again when I got home. Funger sounds more rude. I like it! Thankfully, we are well served with real butchers and with proper fishmongers too. It’s my own laziness that starts these episodes off. I should try harder. Me too, but sometimes the one-stop-shop aspect of supermarkets is handy when you’re busy. I had exactly the same experience as you, trying to buy shin of beef in my local supermarket, whereas my butcher had everything I wanted and knew how to cut it up. And showed me some easy butchers’ knots for good measure. What a star. That’s why you pay the good money Linda. Sadly I think it’s the blind leading the blind in supermarkets. Most customers have no idea which cut is which and the staff have no idea either. They don’t even know the difference between rump steak and braising steak. All the major supermarkets in London sell Silverside as a roasting joint, but the don’t tell the customers it should be pot roasted slowly. If roasted quickly in the oven it will be as tough as old boots. I have steered clear of the silverside for just this reason MD. I have pretty unpleasant memories of school dinners, chewing on grey, leather like meat smothered in Bisto. Thankfully, I have learned a bit over the years. I find it shocking that supermarkets sell the cut as such – there must be a huge amount of people out there who are clueless as to why their Sunday roast turned out so bad. 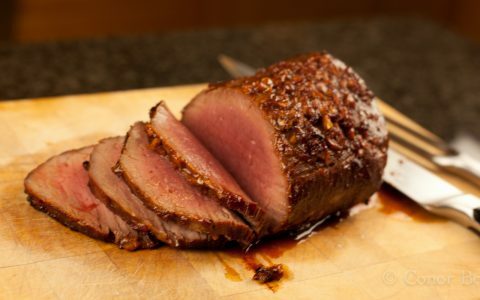 Silverside is actually very good when cooked in a cast iron casserole for 3 or 4 hours and should be sold as such. You are giving me ideas MD. I must try it. That looks marvelous Conor. No hamming in that recipe. And when you finally come to getting the beef shin bone-in, break a leg! I am struggling to find another acting pun here Adam. I guess I’ll just have to leave your comments in the lime light. 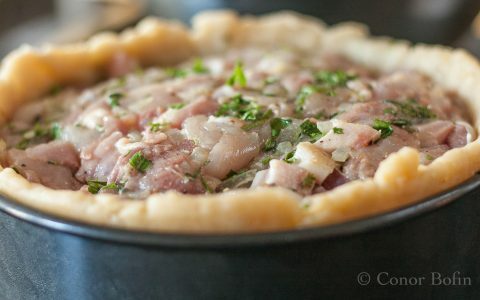 Great read, and recipe post. haven’t bought from a supermarket in years. We, too, are lucky to have a great Real Butcher here. Thanks Colette. I have learned my lesson. That looks amazing Conor, the kind of thing you’d like to know is working away at home while you battle the throngs in town for Christmas shopping. I need to make the effort to stop off at butchers more often myself – we’ve seen a well known Cork butcher close his doors in recent weeks, such a shame as it was a family business that had been around for 138 years! I live in fear of battling my way anywhere at Christmas time. The mash really made it special and I should post it on another occasion. I hate to hear of independent craft retailers closing. There is an inevitability to some of it but the more we support them, the longer we will have them around. Perhaps a cane was needed to jerk the Futcher off the stage? I am so glad I have the option to deal with real butchers. At the retail supermarkets, I just don’t bother… great post (as always). Too kind of you. The supermarkets really need to raise their game or we need to lower our standards. Otherwise, there will be conflict. We can only hope it is not the latter of the two…We sacrifice quality and flavor if we give in. A stout would work really well indeed Barb. You are giving me ideas. Perhaps as an encore? Glorious stuff Barb. It’s on the list. Cool! Feel free to connect mine with yours! Exciting! I still have a lot more of your recipes to try! Excellent backup dish. Hilarious re: futcher. I’ve encountered this myself, though I do find that in the larger more forward-thinking supermarkets in NYC the staff seems to be knowledgeable in the butcher department, which is a huge help. I’ve been cooking with dried porcinis lately too. I think it’s just so perfectly seasonal. Thank you Amanda. The Futcher is no friend of the cook. Perhaps in time they will get their act together over here. For now, it’s all based on volume and the lowest common denominator, or so it seems from my side of the counter. The porcini are excellent, particularly with beef. I pity you on the Futcher front. I have to say, I like the thought of a little chili heat in there. It’s crazy how bad supermarkets are at providing good cuts of meat. It’s just dumbed down. We are very limited where we live. At our co-op they have a butcher/fishmonger and I asked if they could descale the fish and they were confused that fish have scales! Scary. Thanks Kate, So far we have Futchers, Fakers and Fungers mentioned here. We need to keep our eyes out for these chaps. The encore will be fun, for sure. 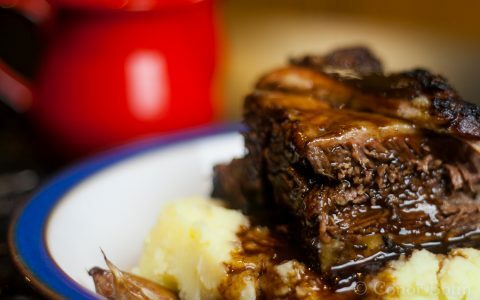 Your short ribs look fantastic and I really love the idea of a mushroom mash. The mash was a revelation for me. We just bought a quarter grass-fed cow and dressed and packaged to our liking. We had some amazing short ribs from it the other night. Sorry no post about them, I was just arriving back from a week out in frigid Nebraska. Minus 12F and minus 25F wind chill made for a non-pleasant stay when I ventured each day to my car to get back to my hotel room… But your treatment of them looks divine! I read about the Nebraska trip. Rather you (or anybody) than me. Good to have got the beef all the same. The food looks and sounds delicious but the metaphor is divinely prepared. I think there’s a one-man show in this, Conor. Thanks Tara. That is what it was in the kitchen. 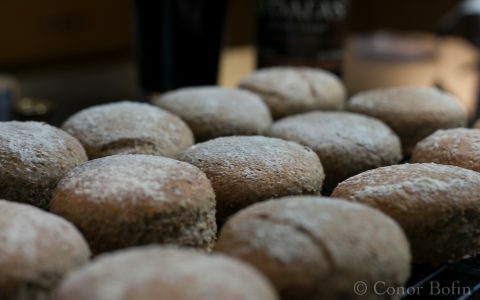 Lovely recipe, lovely, Conor but I have zero sympathy with you (smiley face) – you above ALL should not be anywhere near a supermarket looking for meat – I’m telling Harry and Declan they were understudies to your Futcher…………………..again – lovely recipe, but why inflict this Futchering pain on yourself? I have to take your admonishment like a man. I have erred and I am now back on track. Harry and Declan would not be impressed either if they knew I was ogling the meat in Tesco! Beautiful. I fortunately can get short ribs, and often do although my husband claims they’re too fatty. With 4% body fat he’s a bit of a freak, so I save short ribs for company, when he has no other choice. Where I live, I have only fungers, futchers, fakers, and feesemongers. So sad. I might have to cancel your invitation Dedy. You should try the mushroom mash, if you can get potatoes out there! Mr. Kosher sound like my kind of guy. JC probably has a private army of personal butchers. Ugh – You went back there after your last fiasco? You certainly are an optimist. 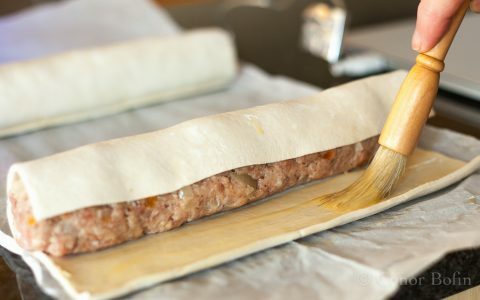 We are lucky to be seeing a pretty strong resurgence of artisan butchers and in house processing here. But I feel your pain. Keep the faith. Yes and no. A different establishment, the same approach. I really should know better. Ha, love how you’ve shattered the illusion of retail theatre. Supermarkets really are crap, the ones around here seem to be out of the most normal ingredients each time I want them. Today – celery, yesterday – sweet potato. I mean come on! That mushroom mash (mush?) is a beyond brilliant idea! Mush just doesn’t do it justice. But it made me smile. Side note: we don’t buy meat from supermarket. We go to the farm … About an hour drive. Pick the animal/bird, slaughter and process/cut the meat whatever the hell way we want and comeback home with a BIG smile! Thank you for the unusually amusing post. Love. You are charming as ever Nusrat. Great to hear from you. The farm trip is as straight as it gets. Hell yeah Conor. Just hell yeah! Just look out for me posting about salads. It should be warming here. What am i going to eat tonight then i think but dont say – too nice, English ‘spose. We Irish suffer from just the same thing. We don’t get any service and we happily thank the guy behind the counter. We need to stop this nonsense and be a bit more assertive. Thanks Wendy. For sure there are more great recipes to try while the Futcher sells his packets of chopped meat to the unwary or uninterested. One of my favorite Sunday meals when the weather is cool. I can’t wait to try them with your mushroom mash and your onion gravy. We are set for cold weather here now and this type of dish is a must. Do try it. 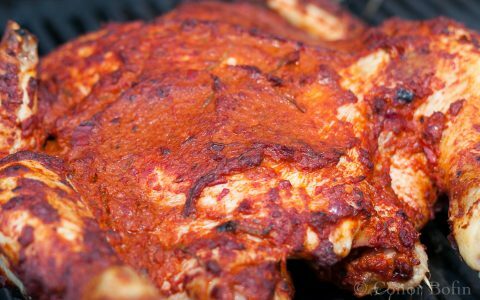 If anything, the meat can be cooked for longer. Delicious with the mushroom mash. Remind me not to set up a butcher shop near you yeh? Hell hath no fury like a blogger scorned. But, yours would be a top class affair. Many thanks for the kind offer. For the moment, I will pass. I have enough trouble managing the blog and the associated social channels. I do this for fun and wish you all the best. I also suspect that the nutritional facts associated with some of what I do might not make great reading! This is a heavenly dish. It’s a good thing that supermarkets don’t know &@!? about meat cuts because it at least gives the independent butchers a chance. 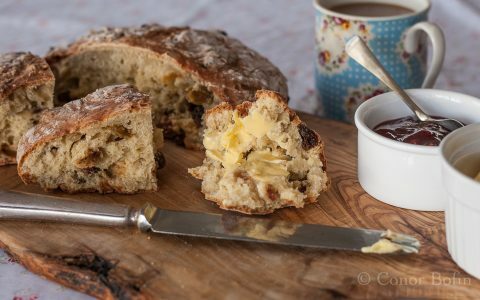 Hi Conor, made this yesterday after a trip to Fenelons, went down a treat. I had to fight my son over the leftovers tonight. Brilliant Brian. They always seem to have a nice selection of the short ribs. A very under valued cut (thanks be to goodness). They also have a decent game selection. I will have some fun with that too. No wonder you were selected for Freshly Pressed- you’re incredibly funny. And lovely food and photography. 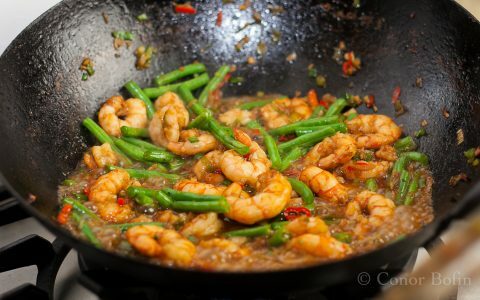 Hi Conor, this went down so well first time, I am cooking it for 12 tomorrow, New Year’s Eve. Wish me luck! Fantastic Brian. The more, the better for generating flavour. Don’t be afraid to leave it on longer to compensate for the quantity of meat. I love that you are giving it a big party presentation. Incredible success Conor, people were raving about it. I did skip the intreresting Merlot though!